These fairies will bring good autumn tidings to your designs. These Apple Harvest Fairies will be perfect for any fall or harvest design. Fabulous Harvest fairies with an apple theme. 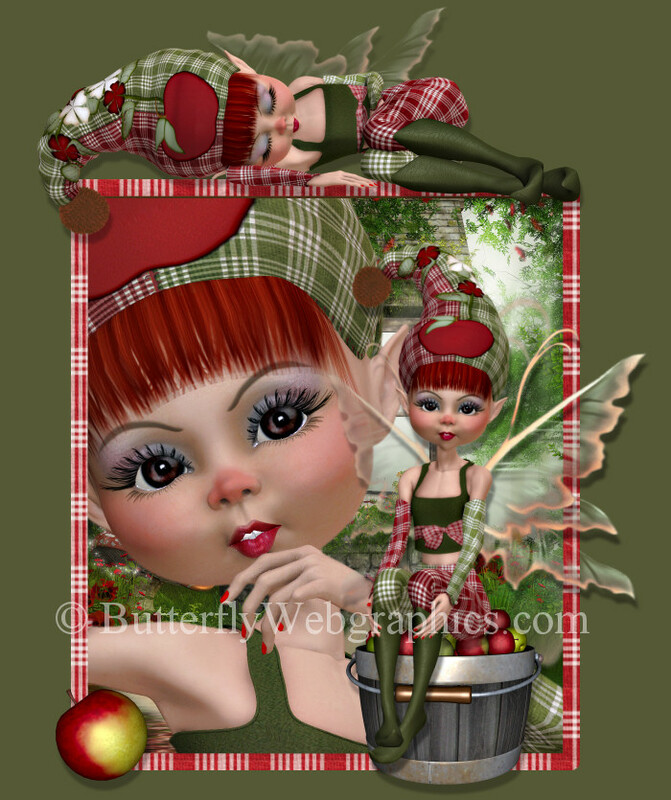 Apple Harvest Fairy Graphics, dreamy Fairies in an apple theme. They’re absolutely adorable, and they’re heading your way to bring good tidings to your door this fall! You’ll be glad when they arrive, because Autumn wouldn’t be the same without their magic. For these little fairies make sure that every apple blossom blooms in the spring and every apple is ripened to perfection in the fall, delicious and crisp at harvest time. What would fall be without apple pie, apple cider, candy apples, apple crisp, and countless other seasonal delights that lend autumn its unique flavor? So welcome these fairies in and make your Thanksgiving or autumn designs something you’ll give thanks for. This package also includes some apples and apple barrels as seen in the promos. The size of these images varies, but they are approximately 1800 X 2100+ pixels. All are 300 DPI, making them great for print projects. Members can use the tubes for various personal or commercial projects, including web design, template design, graphic design, t-shirt design, candy wrappers, scrapbooking, and for signature tags, but please read my terms to learn more. If you have any questions, please email me. This package has been divided into three zip files which are approximately 11-52 MB each.